For songwriter Ryan Tucker, the meaning behind The Rupees music is simple - ‘No messing about and nothing plastic, we’re making music that is going to give you energy, make you move, sing, and lose yourself in. Escape the 9-5, escape everything for a while and be somewhere better’. The Rupees are a garage rock band from Bristol. A collision of guitars and synths their distinctive and unique sound is a wall of snarling vocals, atmosphere defining synthesizers and sharp fuzzed guitars that culminates into nuclear mutation of Kasabian, The Vaccines and The Clash. The songs are an enticing soup of curt attitudes, titanic choruses and driving upbeat energy. Ryan, Seamus, Jake and Tom are The Rupees and their music has already been showcased on BBC Radio 1 (Huw Stephens), BBC Radio 6 (Steve Lamacq), and Sky TV. 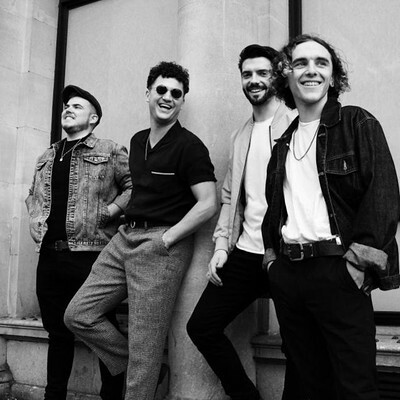 Having played Reading Festival, supporting bands such as Blossoms and The Growlers and selling out numerous headline shows, the guys are making some serious noises and are clearly ones to watch.